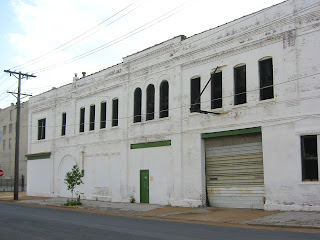 Last week the demolition permit was issued to SLU to demolish the historic livery stable at 3401 Locust. The west wall of the building facing the a portion of the parking lot that already surrounds the building. A gaping hole in the Locust Street facade reveals the buildings heavy timber framing now open to the sky. The metal straps seen on the underside if the beams is a somewhat unusual engineering design employed to increase the spanning capacity of the timbers. 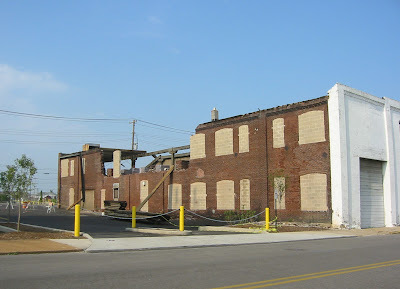 The recently demolished Switzer Building used a similar technique although with much larger iron members. 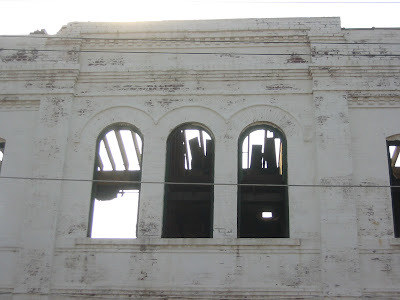 Some of the last roof joists are visible through the east windows along Josephine Baker. 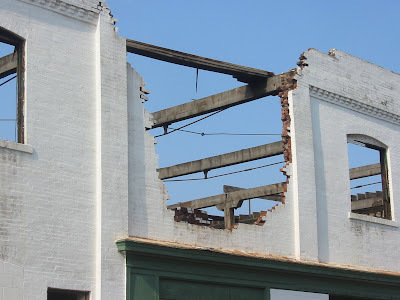 Concerns reported by Ecology of Absence about the future of an old livery stable building on Locust Street at Josephine Baker were confirmed by city records showing that SLU, the building's owner has applied for a demolition permit. The building was built in 1885, with additions later in that decade and a major renovation in 1902. Along Locust, what were probably at one time large storefront windows (the building was used also as an auto showroom) have been filled-in with concrete block and garage doors. The east elevation also contains large openings, filled with block. 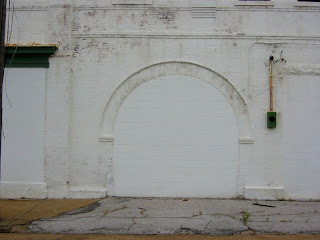 In-filled openings such as these however are routinely reopened in renovations occurring around the city. 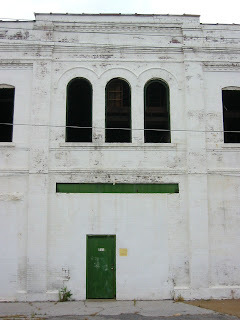 The building does not appear to have any obvious structural faults, so demolition seems un-necessary. North and west of the building, SLU is constructing a large surface parking lot. 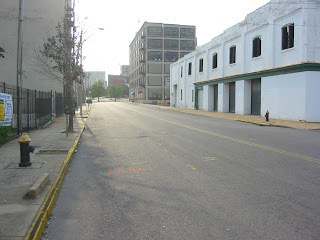 Since the alley is being vacated for most of the block, it is presumed that SLU will pave the site for more parking, creating one large lot occupying two thirds of the block. To the north of this, across Washington, SLU demolished a few smaller undistinguished buildings and is building yet another parking lot stretching to Samuel Shepard. I'm not sure what all the new parking is for. The livery stable occupies a very important location along Locust. East of Josephine Baker, Locust has undergone an amazing transformation in the last several years with almost every building undergoing renovation with beautiful facade restorations, and are being filled with creative firms, offices, restaurants, etc. The block between Josephine Baker and Theresa however is quite desolate. The Drake Plaza while beautiful, has no storefronts or offices facing Locust. 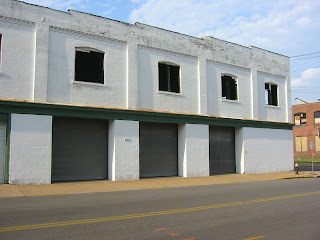 The building west of the Drake formerly Interiors Unlimited is also owned by SLU, and shows no signs of activity or occupancy. Around the corner on Theresa however, is the new Moto Museum and west of that on Olive, the recently completed Centene Center for the Arts and the Metropolitan is undergoing renovation into a hotel and retail. 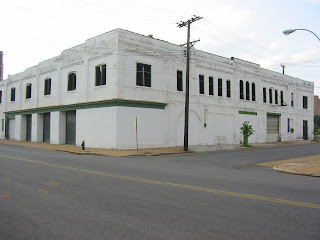 The livery stable building then holds a key ingredient to tying the Locust Street corridor with Grand Center to the west if it was retained and rehabilitated, or becoming a vast wasteland of surface parking and a barrier to tying the two areas together if demolished. 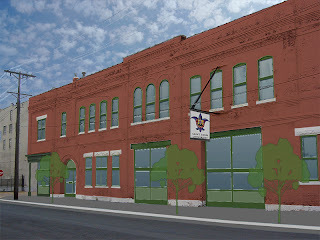 Architect James Wehmueller of Kansas City submitted the attractive rendering below showing what the building could look like if renovated instead of being bulldozed into the ground. The view is along Josephine Baker looking southwest. Thanks James!! 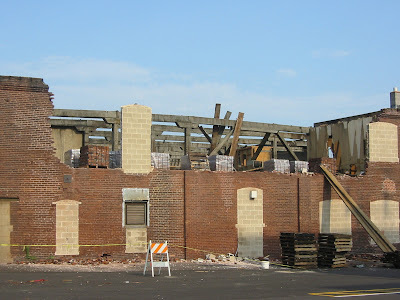 Update: Channel 5 did a story on the impending demolition of the stable this evening. Here is a link to the video. Jeff Fowler, a spokesman for SLU confirmed that the Livery Stable will be demolished for parking for SLU's new arena currently under construction. 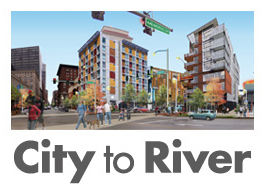 Fowler claims that SLU needs to provide more "convenient parking" for the arena. The new "convenient" parking lots on the stable site and farther north are over a third of a mile from the new arena. A quick look at the surroundings of the arena shows that there are several existing surface parking lots containing hundreds of spaces that the university is probably not counting, since they don't own them. Humans however are resourceful, and will find the places to park that are closer and use them. 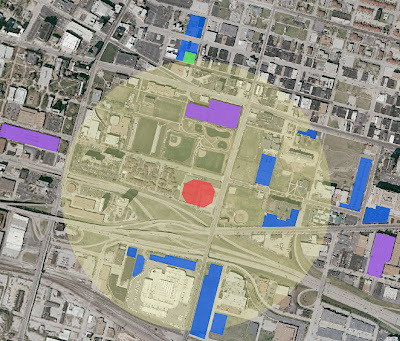 The map below shows the arena in red, a third of a mile radius in yellow, the Livery Stable in green, and surface parking lots in blue. While Harris Stowe may limit parking for the arena, so they still have parking for their facilities, south of the highway, Metro and Midwest Consulting, with two large lots may be able to earn some extra income by changing people a few bucks to park on their close-by lots. Also, beyond a third of a mile, SLU is probably counting their Laclede Garage in towards filling the needs of the arena, but might be overlooking the giant AG Edwards garage that is about the same distance away, as well as their seas of asphalt surface lots and a large lot owned by Sigma Aldrich east of Harris Stowe. 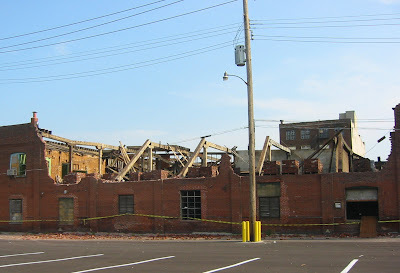 Given all of this parking capacity, it is hard to justify the demolition of the stable building.